Ok, so it’s National Pie Day, mathematically speaking anyway…but as foodies we celebrate with “real Pie”. 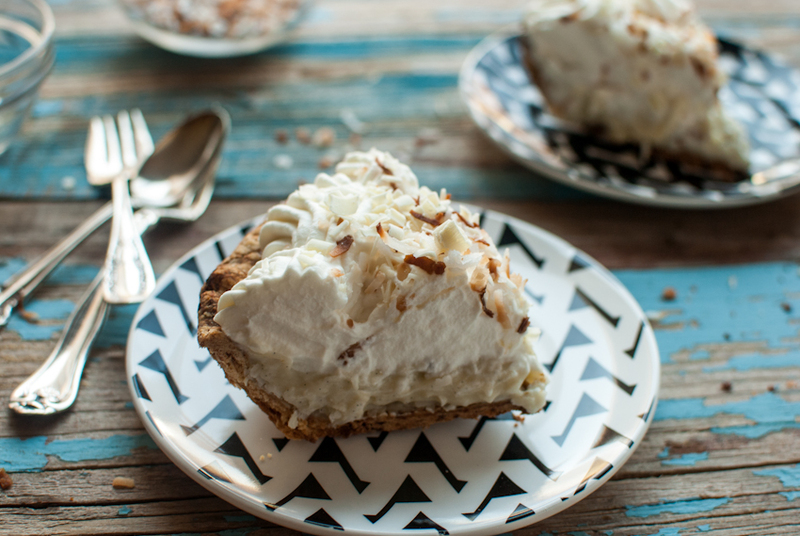 Coconut Cream Pie…it’s the total comfort food of pie world and this is the pie that put Tom Douglas on the map! 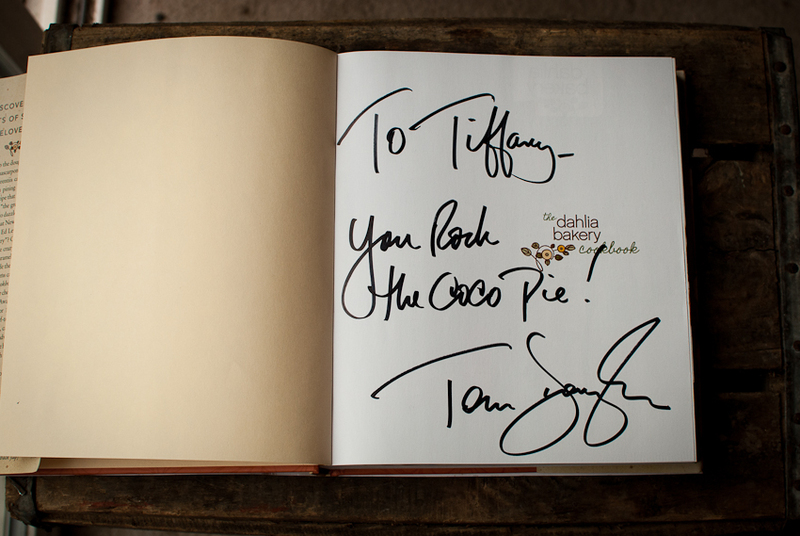 Last year I got the chance to meet him and have him sign his cookbook… he asked me what was going to be my first thing to bake out of his Dahlia Bakery book, of course I said the Coconut Cream Pie! If you ever visit Seattle, you must make a stop at Dahlia Bakery. They bake amazing deliciousness! And no, you don’t need to buy a whole pie to try the coconut cream pie, they sell mini individual bites and keep the case stocked of these at all times! My other favorite they bake in the Fall is the pumpkin whoopie pie….helloooo Fall in a treat! Cheers and Happy Pie (3.14) Day! Combine milk, coconut milk, and shredded coconut in a heavy medium saucepan. Use a pairing knife to scrape the seeds from the vanilla bean and add the seeds and pod to the pot of milk. Place the saucepan over medium high heat and stir occasionally until almost to a boil. In a bowl, whisk together the eggs, sugar and flour until well combined.. Temper the eggs by pouring a small amount of the hot milk mixture into the egg mixture while whisking. Then add the tempered egg mixture to the saucepan of hot milk. Whisk over medium heat until thickened being careful not to over cook the eggs. If they start to resemble scrambled eggs, then throw out and start over. Remove from heat once thickened, about after 5 minutes, and add the butter and whisk until melted. Remove vanilla bean pod. Transfer the pastry cream to a large bowl set in another bowl over ice.Stir occasionally until cool. Place plastic wrap over the top to keep a layer from forming and place in the fridge to chill completely. 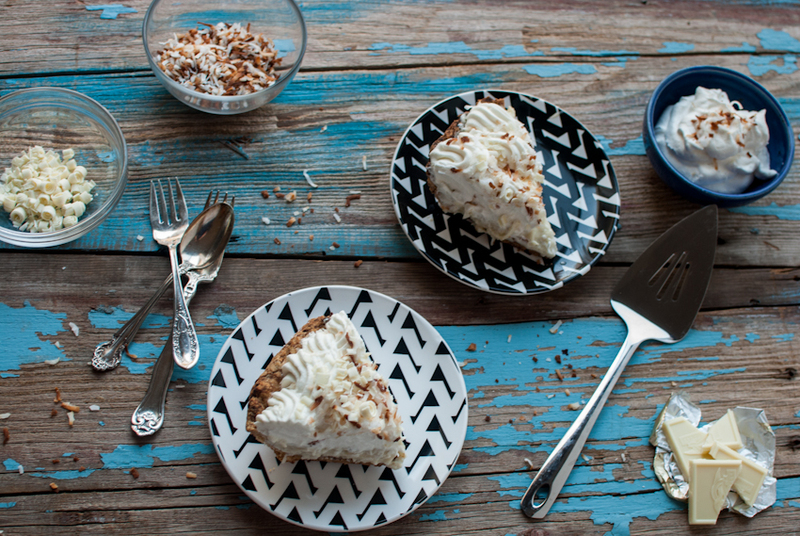 When cream is completely cold, fill the coconut pastry pie shell with cream. Smoothing the top with a spatula. In a large mixing bowl or electric mixer with the paddle attachment, whisk heavy cream, sugar, and vanilla until stiff peaks form. Place in a piping bag with a large star tip and pipe chipping cream on top of pie. 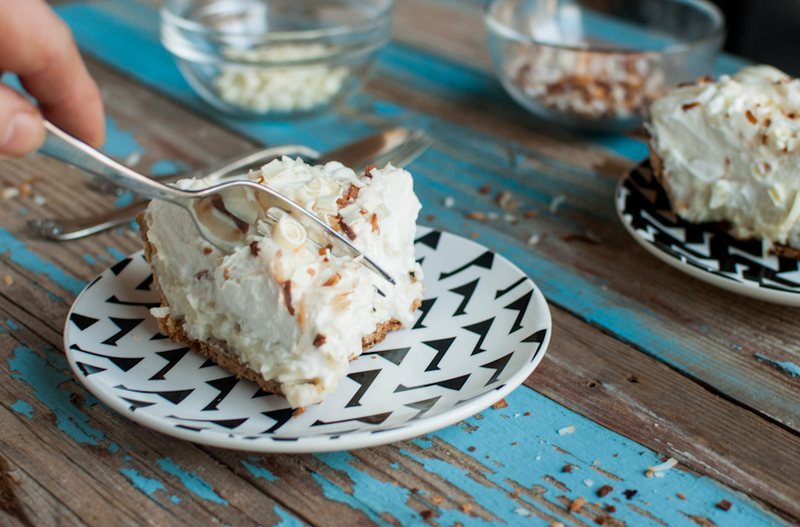 Sprinkle top of pie with white chocolate curls and toasted coconut. The more the tastier! In a food processor, combine all ingredients except water. Pulse to form small crumbs. Gradually add the cold water, pulsing after each addition. Use only as much water as needed for the dough to hold together, you may not need all the 1/3 cup. Place dough onto a sheet of plastic wrap forming into a ball, wrap and chill for one hour. To roll dough once chilled, unwrap and place on a pastry mat or floured surface. Roll dough into a circle about 1/8 inch thick. Place dough carefully into 9 inch pie plate and trim edges. Crimp edge if desired. Chill unbaked pie shell for at least one hour before baking, this will prevent the crust from shrinking when baked. Place pie weights on bottom of crust and bake for 25-30 minutes. Remove weights and bake for another 10-12 minutes until golden brown. Remove pie from oven and let cool on a cooling rack before filling. Wow, what an incredible pie! Beautiful pics, sounds delicious!! I might have to try something similar made with coconut cream/all coconut milk, on an almond flour crust! I haven’t had a fluffy pie like this in years! Your pie looks amazing! In the recipe, you say 2 cups of shredded coconut. Is that sweetened coconut? Desiccated ? Thanks . Pam, thank you! It is shredded sweetened coconut. i have this cookbook. i’m going to try to make this pie too! looks amazing. I LOVE Dahlia and your version looks AMAZING! Gorgeous photos BTW. Keep up the good work! Tiffany, Coconut Cream Pie was Andrew’s Grandmother McIntyre’s very most Favorite pie, although she never learned to make one from scratch, I am sure you would send her to heaven with this pie (if she wasn’t already there)! Other comment from me: You served Coconut Cream Pie without me????? OK, so I will have to make one for myself! That’s the point, right? Yours looks delicious.